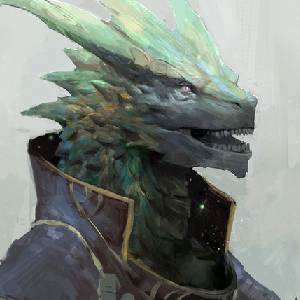 King Strato Vyrocian is the elected King of the Gemscales. The previous bloodline was killed during a rebellion and Vyrocian was elected. The rebellion was known as the Ash Rebellion. The Ash Isles, home to hundreds of low class gemscales, off the northern coast of the Dominion of Gemscales sought to overthrow the King of the Dominion in hopes of gaining freedom from it. They successfully planned and assassinated the previous King, Moriok Blaytose. It is said that Moriok was sending fleets of soldiers to the Isles and kidnapping children in hopes to figuring out how to force Gemscales to be born with dim scales. This would upset the hierarchy in place. When the peasants realized this they led a rebellion. When the king was dead, Strato Vyrocian stood above all others and claimed that he would see to the equal treatment of the Ash Isles. His first decree was to clear the Ash Isles of all the ash that has been blown across from the Volcano of Erythra. Vyrocian hopes that if he can stop the volcano’s plumes of ash, he can revive the isles and the peasants can live in happiness. Recently he has followed up on his promise and has brought in strong mages from the Lunastia Confederacy.